The following outlines some of the things that I have learned whilst trying to integrate a PayPal payment gateway into the MVC 4.0 website. After much reading I determined that I easiest way was to use the PayPaylMerchantSDK. This is implemented using the PayPal classic API which is the only API available in Australia @ the time of writing. The easiest way to add this to your application is to use NuGet in Visual Studio (Tools ->> Library Package Manager ->> Manage NuGet Packages for Visual Studio) and search for PayPal. You should download and use the “Merchant” solution in the .net code samples that can be found here. The code samples have an App.Config file that contains the base configuration for working with the API. It contains the log4net and PayPal configuration section. You should copy these configuration sections into your web.config file. When coding I want to access some of the PayPal settings that I just copied into my web.config file, for example “paypalUrl” could be used when attempting to send a request for express checkout. I thought that it was dangerous opening port 80 through the firewall to get to my development server, so I was clever and used an unusual port number. This worked fine for most things but the IPN testing would not work with my special port number. You have to use port 80 to allow the IPN test to work. The old way of implementing the IPN callback has been integrated into the PayPal .Core SDK. This can now be implemented in 3 lines of code. Note I then created a PayPalTransaction Class to simplify access to the PayPal.IPNMessage object. What is the best unique computer identifier? I have been trying to find out what is the best way to uniquely identify a computer for licensing purposes. In a previous post “Read computer sid on 64-bit machine” I show how to get the Product ID of the operating system as the unique identifier. This seemed great and I even used it for a licensing tool until I installed the software on multiple virtual machines! The VM’s were cloned from the same base image and guess what? They all had the same Product ID, which meant that every computer passed in the same ID. Most computers these days have many network cards, USB wi-fi etc, so which card do you choose to get the MAC address from? Unless it’s in a laptop or onboard, NIC’s can easily be replaced. Thinking logically you want to use an identifier that is likely to change the least so CPU’s, NIC’s, Hard Drives etc etc should all be rejected. The one component that generally doesn’t change very often is the motherboard. The motherboard has a UUID (Univerally Unique Identifier), that can be read from the bios. This value is unique in both physical computers and Virtual Machines. To get a unique identifier for a computer the recommended key is “ProductId” that is accessible from the following registry key – HKEY_LOCAL_MACHINE\SOFTWARE\Microsoft\Windows NT\CurrentVersion. This is the value you see as “Product ID” on the properties screen of your computer. To access this key can be a little problematic if you are attempting to read the “ProductId” sub-key on a 64-bit machine from a 32-bit application. This is due to Registry Reflection or WOW64 as it is sometimes called. In short the 64-bit OS shows 2 logical views of certain portions of the registry on WOW64, one for 32-bit and one for 64-bit. In the case of the “ProductId” key it explicitly exists in the 64-bit view so the following code will fail to find the key, as when running inside the 32-bit application it accesses the 32-bit view of the registry and fails to find the key. To make this work you have to explicitly request c# to open the 64-bit view of the registry. The following code sample will work. You have a parent/child table structure in your database that looks like the table structure outlined below. You have used the EntityFramework or Linq to SQL to build your data access layer. Obviously I would have foreign keys between parent and child.. you get the idea, this is your basic run of the mill one to many, parent child relationship. I looked around the web to find a simple example of how to do this and I could not find one, that explained how to do an easy join syntax between two tables. 2. Check the Return Code from the stored procedure call. 1. Create a PowerShell function to execute a stored procedure. I struggled with getting this to work and did not find any exact examples that explained it exactly as I wanted. This procedure will accept a single integer parameter and divide by it. If zero is passed in the procedure will fail with a divide by zero error and return the return code of 0. Any other number will succeed. Create a file called test.ps1 in your c:\Scripts directory. I will talk you through a few of the interesting points of above. This gets the “ReturnValue” from the stored procedure and then casts it to an integer. But it made no difference to the output of the function. I will confess I don’t now a great deal about PowerShell but I have worked through this problem to get a working solution. I figured this is a zero based array so I just accessed the value in position 3 i.e. $out, which is already of type “int” due to the cast in the function. So now I have the integer return value in a variable $returnValue I can use it in my conditional logic. If the value was null or == 0 then it must be in error else success. Implementing this means you can execute a stored procedure and if it fails , you can cancel any further processing in the Script. I recently had to use this code again and I found that the best solution is to have the stored procedure return “non-zero” values, eg 1 for success, -1 for failure. The issue is that the return code from the “executeStoredProcedure” call will be zero in certain catastrophic conditions. For example, break your connection string on purpose and the stored procedure will never get executed and the return code from “executeStoredProcedure” is zero. By using non-zero return codes you now have 3 possible states, 1 – success, -1 failure, 0 – catastrophic failure. I extended my code to use “blat.exe” to send admin emails on return code zero so that if my powershell script failed to run someone is notified. 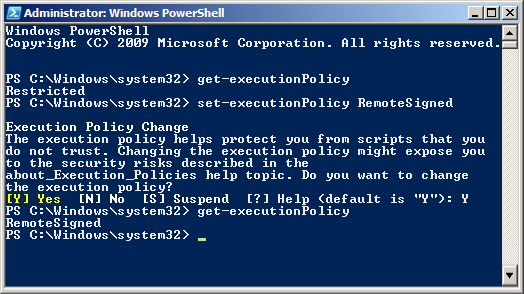 You need to do the following to set the executionPolicy. 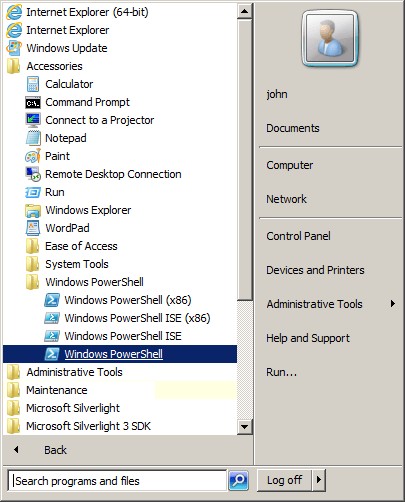 On a Windows Server 2008 box you may be wondering where the Windows PowerShell ISE is. I wrote the original Boostrapper Manifest Generator (BMG) blog post a few years ago. It is one of the most heavily visited pages on my site so I thought I should revisit it, and given that the BMG is so buggy it could be useful to have some screen shots. I will provide 2 concrete examples of how to use the BMG to create a bootstrapper pre-requisite check. All this is being done on a Windows 7 32-bit (Virtual) machine, with visual studio 2010 installed. The application that I am going to bootstrapper is a small test application called “GuidGenerator”, can you guess what it does? 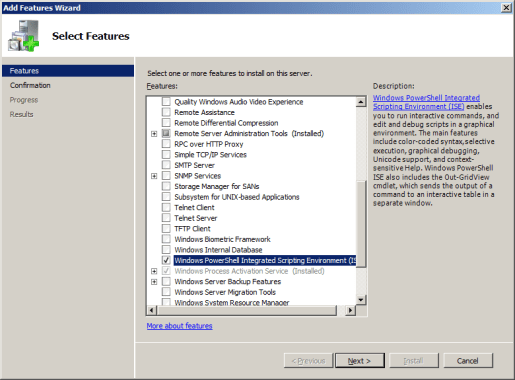 I will be using a standard setup deployment project to create the installer. Enter that into the path and choose OK. Note: This bootstrapper folder is important – read the tips and tricks at the end. 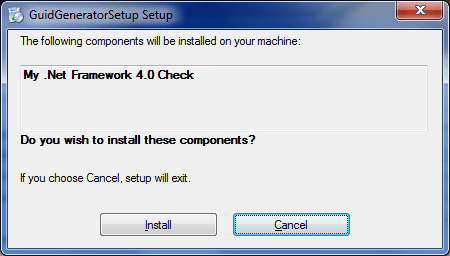 Click back on the “Package” option which is the root of the tree menu on the left and set the Product Name to DotNet4Check – this becomes the name of the folder that the package is created in. Note: You have to do it in this order as if you set the package name before adding a file it crashes the BMG. Click into the product code field and it will default with the “Product Name” just set, (otherwise this can throw a warning if left blank). You want to set up a system check that fails if the condition is not met, or alternatively by-pass the install if a condition is met. If it fails the check then it will prompt the user that they need to install the pre-requisite. For the .Net Framework I have chosen to do a simple registry check for the .Net Framework version. Switch to the install conditions tab. This is where we define when our installer should be run. Results, note that in my case it succeeded with no errors, and the path contains the folder name that I entered in the product name field. On the properties window Click the “Pre-Requisites” button. Deselect anything that is selected that you do not require and choose your check. Build the setup solution in release mode. Copy the release directory somewhere to a machine missing the pre-requisites. The release directory should look something like this, because we chose to set the download from the same location. In this example we want to supply a web download version of the installer so you don’t have to distribute the requisite files with your installer. After adding the file you get the Properties tab. Enter the URL from the tips below in the “HomeSite URL” setting. I used – http://go.microsoft.com/fwlink/?linkid=182805 for the .Net 4.0 Framework. (remember you must right-click and choose paste). 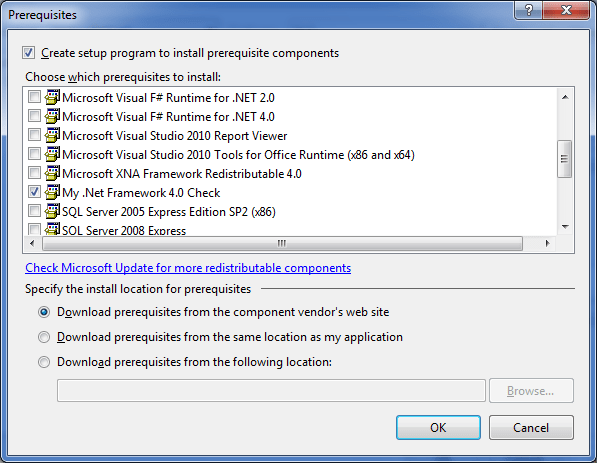 When setting up the package pre-requisites choose to “Download Pre-requisites from the package vendors website”. Repeat all the other steps and when you choose “install” from the bootstrapper prompt you should get a message that it is downloading. The “Bootstrapper” directory is your friend (on my machine “C:Program FilesMicrosoft SDKsWindowsv7.0ABootstrapper”). If you have access to a VS2010 installed machine and go to the bootstrapper directory and into the Packages folder and you will find bootstrappers for 19 different things, including .Net 3.5/4.0 and Client installation versions. I suspect if you took a copy of the packages folder back to your older VS2005/2008 environment you would get the pre-requisites. If you don’t intend to set up exit conditions don’t switch to the “Exit Conditions tab”. if you do it will put an empty condition in that throws a warning at build time. The only way to get rid of it is to enter 0 / Success. I suspect for things like .Net you want the user to be able to download the .exe directly. Here are the URL’s provided by the .Net bootstrappers installed with VS2010. My web install failed because on my Install I happened to click into the “Value” field and it put the following “N/A for ValueExists and ValueNotExists”. This created an “unexpected error” on install. I went into the product.xml file and set value=”” and it worked. Thought this was really cool. I want to find a user by username. Usually you would loop through looking for the item with the matching username and return the user that was found. Much less code, and you could match on any property of the object that you wanted. The problem is that the control has not been successfully created and all the internal controls that make up the user control, like text boxes etc, will be null. The way to create the control is with the “LoadControl()” statement.